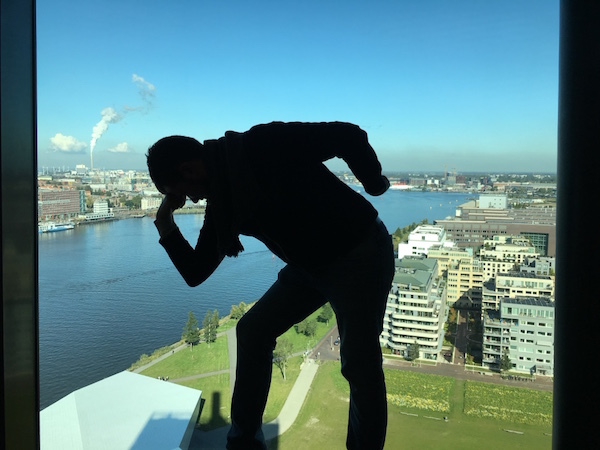 That was the question on everyone’s lips who I spoke to about my impending plan to visit Amsterdam, the capital of The Netherlands, and it’s mysterious ‘Noord’ district. 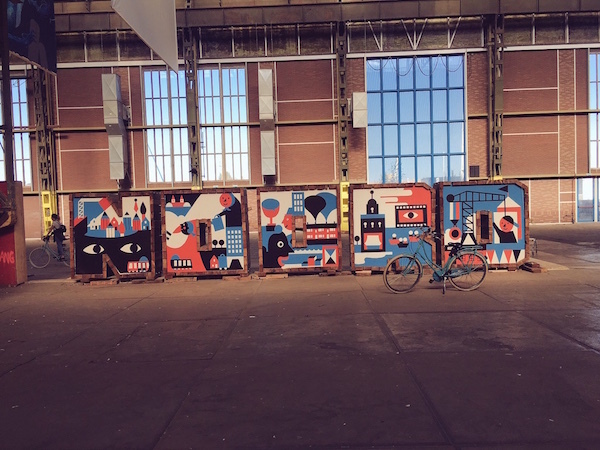 Just exactly what is Amsterdam Noord? Everyone’s heard of the rich culture, history and excitement that Amsterdam Centraal affords such as Anne Frank Museum, the infamous Red Light District and the Dam Square etc. 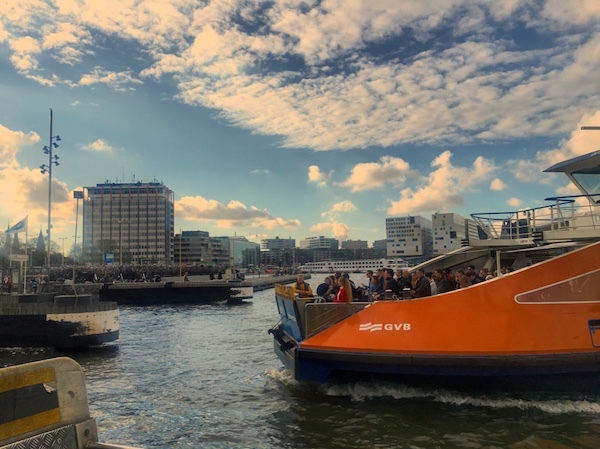 But take a free ferry north away from Centraal Station, everyone started scratching their heads. So, how do I find out about it? 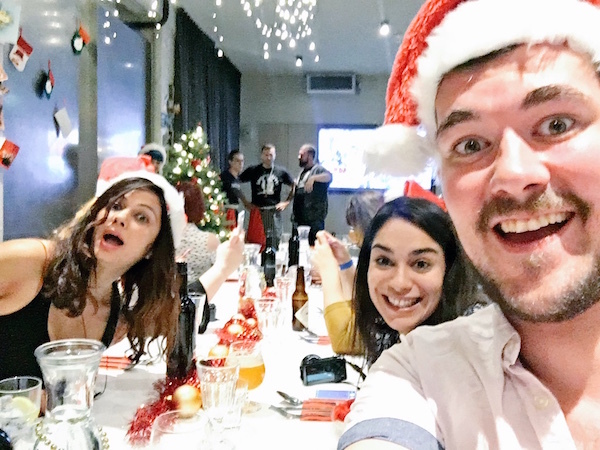 Clink Noord Hostel asked me, along with the #ClinkBloggers17 group, to find out more about the rich (and unexpected) experiences that awaits for us to discover one weekend in September. A pure surprise, but promised, an unforgettable one. 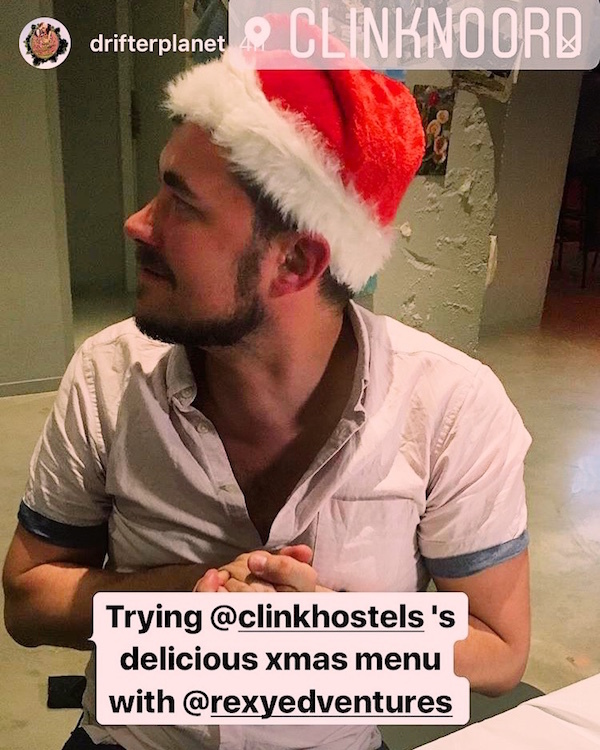 But first, what is Clink Noord Hostel? This is where they quote ‘Dutch style meets creativity at this laboratory turned hostel in Amsterdam Noord.’ When they discovered an unused 1920s laboratory on the banks of the River IJ, they immediately put to work bringing simple and stylish Dutch designs around the original features that shines alongside social and party spaces. 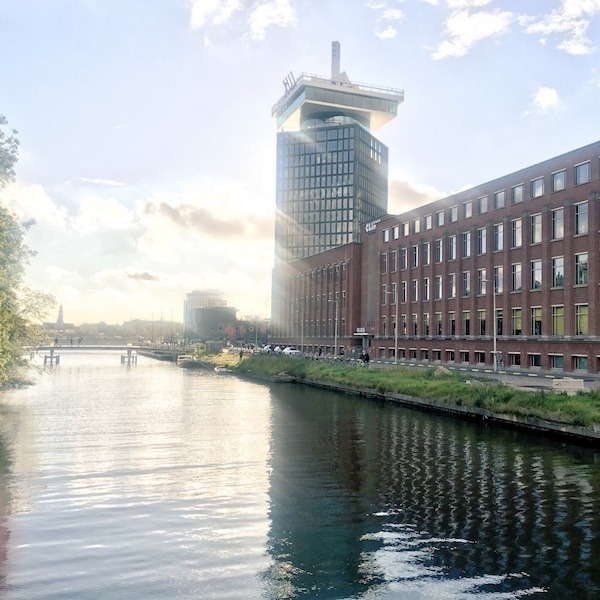 What’s more, with just spitting distance from the main train station via a free ferry (it’s actually much further to walk from Centraal Station to the main city centre), they claim to say that Amsterdam Noord is one of the most creative and culturally vibrant areas. They didn’t disappoint. At all. 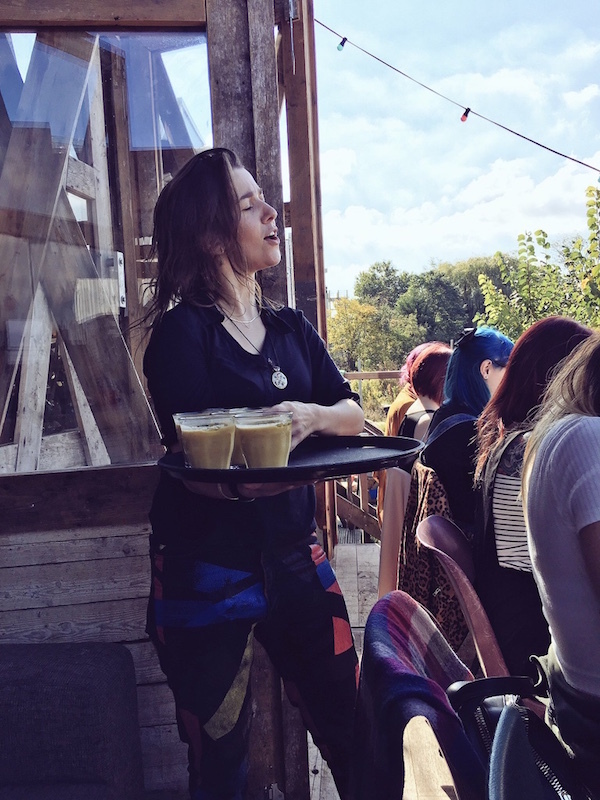 I’ll tell you all about my experience of Amsterdam Noord and Clink Noord now! 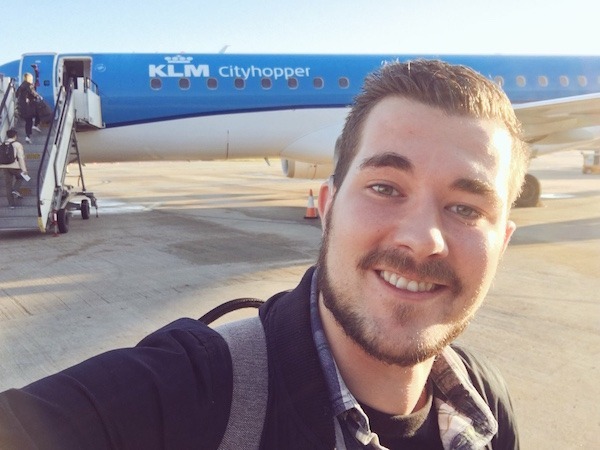 Waking up early on a Friday morning, I took a short flight from London City Airport with KLM in their CityHopper plane landing at Amsterdam Schiphol Airport. With a quick train ride to Amsterdam Centraal, I immediately found the free ferry (just follow a load of cyclists going behind the station on the right hand side as you come out) and that took a few minutes. Once we disembarked, it’s only a couple of minutes to walk to Clink Noord. It’s THAT easy to get there. 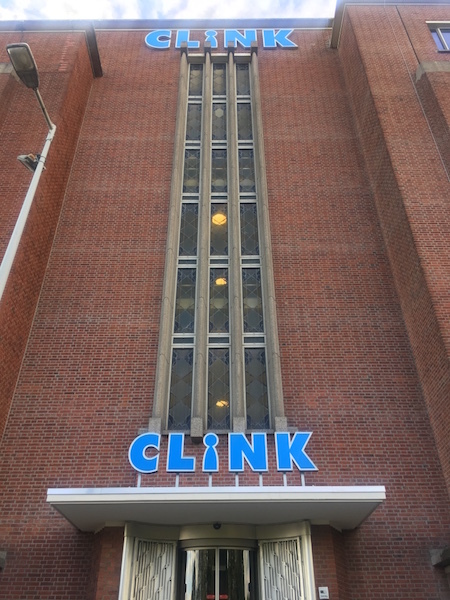 With the big old laboratory rising up in the clear blue sunny sky, you’ll definitely see the word ‘CLINK’ emblazoned above the entrance. But first, I was bemused. Gone were the hustle and bustle atmosphere of central Amsterdam and now in this district, I definitely feel I could breathe and relax. With a lovely view of the River IJ, my smile grew and grew. I was going to like Amsterdam Noord. And I already found my first secret. 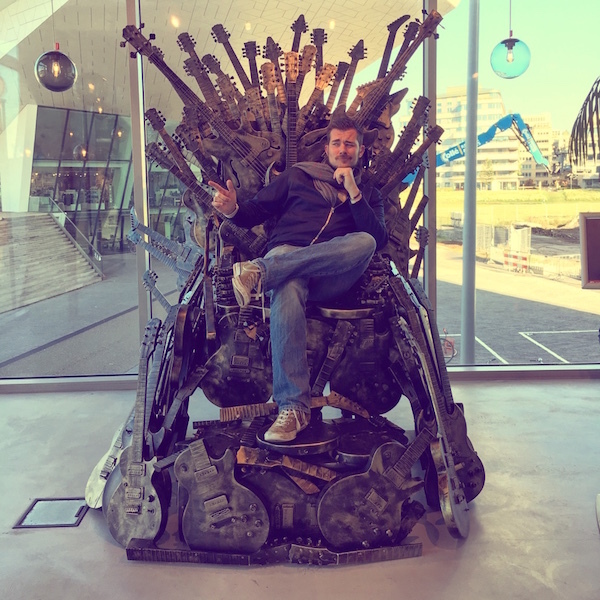 Clink Noord weren’t kidding about creativity. Every single aspect of Clink Hostel definitely lived up to my standards, believe me, now as I get older my standards get higher and higher. Let’s break it down. Reception – Upon check in, I was greeted by wonderfully smiley staff who speedily checked me in. Absolutely great first impressions overall. Social Spaces – Behind the circular reception area, I could see mezzanine levels of social spaces including a quiet area – the Library, a chill out area full of plush seating, tables to plug in your laptop, air hockey area and a beautifully bright space that is the Atrium. 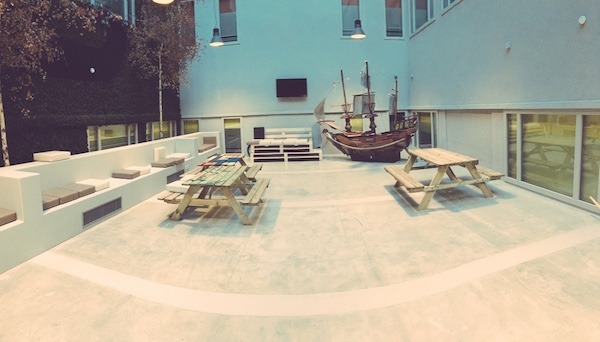 I enjoyed the Atrium especially as it’s a great zen place to chill out on their comfy benches lined across the space. But don’t forget to check out the picnic benches which have been hand painted by the Clink Team! But if you want to know more social spaces, then follow the spiral staircase down to the lower floor, where you’ll be in for a surprise! 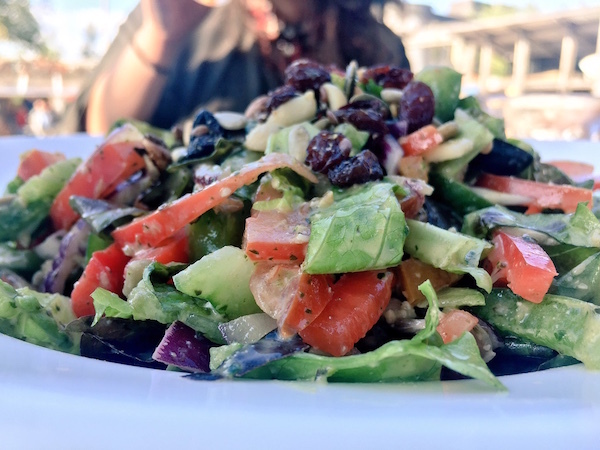 Zinc Bar – oh, yes. This is where you need to be seen and heard. With funky tunes playing and a modern twist atmosphere full of bar stools and captivating artwork from locals, you’ll definitely be rocking out at the many themed nights that takes place here. When we were here to meet the other #ClinkBloggers17 on Friday night, both Sophie’s Scran and I played the hilarious pub quiz (we called ourselves ‘Will Blog for Beer!’), we ended up winning a free cocktail! Woop, woop! Did I tell you about their soundproof nightclub too?! 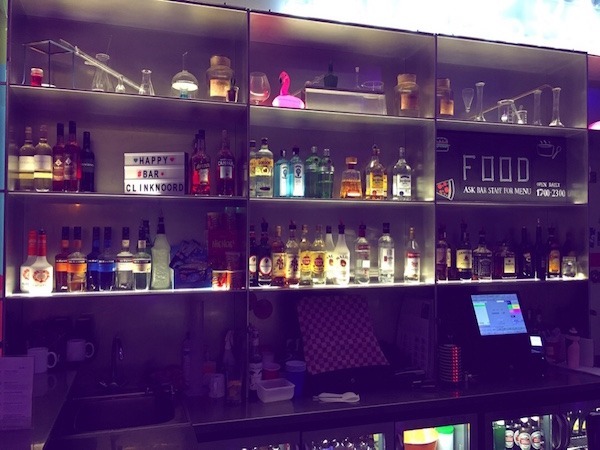 Catalyst Cafe – But if you are looking to get away from the party vibes, have no fear. 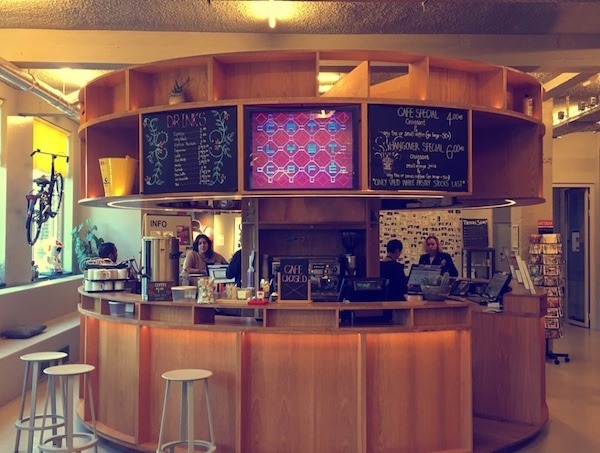 The Catalyst Cafe is here. Based just behind reception, they can give out the meanest coffees around plus you might be peckish for a pastry, or two. Dorm – What about my dorm? With my keycard, I walked into my room and was pleasantly surprised how spacious the room was. The beds were comfy (I opted for a bottom bunk), the room were warm and you had your own light and plug in socket – including a USB port! My two nights here passed with quiet sleep and comfiness. Bathroom – with our dorm, we got our own ensuite. The rainfall shower effect was especially powerful (great to wake up in!) and the sink was big enough to place my bathroom essentials around. Staff – During my stay, I cannot emphasise so much how friendly the staff were. As walking fountains of all knowledge, bar cocktail tricks, and an always sunny deposition, they really do make you feel welcome at home. Breakfast – I do recommend hitting the breakfast early if you like your own space. Based just round the corner of Zinc Bar, you can help yourself to many delicious local delicacies also with coffee and toast. With their choice on display, the food was great to fill you up for your start to the day in Amsterdam Noord. Overall, I give Clink Noord, 9.5/10! So! Now I was ensconced within the first secret of Amsterdam Noord, are we ready to find out more? The next morning, I strapped on my walking shoes on and assembled with the other #ClinkBloggers17 in Zinc Bar ready to be revealed on what would be in store for us today. Again, the weather was a beaut and I couldn’t wait to explore Amsterdam and their local activities in the north district. The next secret isn’t that far away. It’s literally right next to Clink Noord. 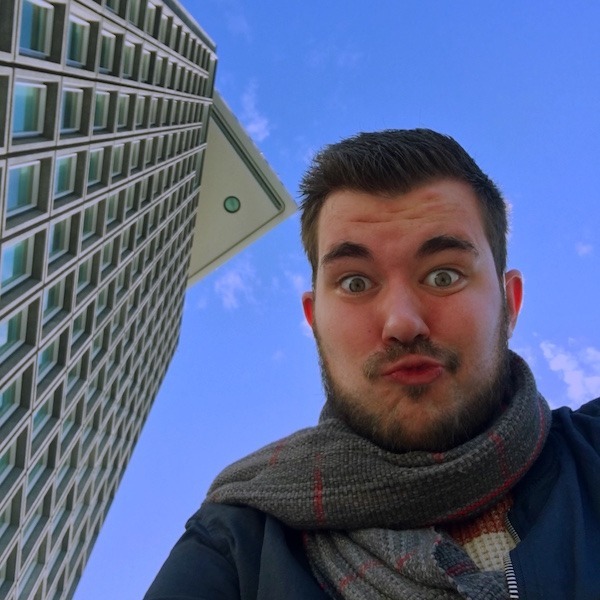 This is the A’dam Tower/LOOKOUT! 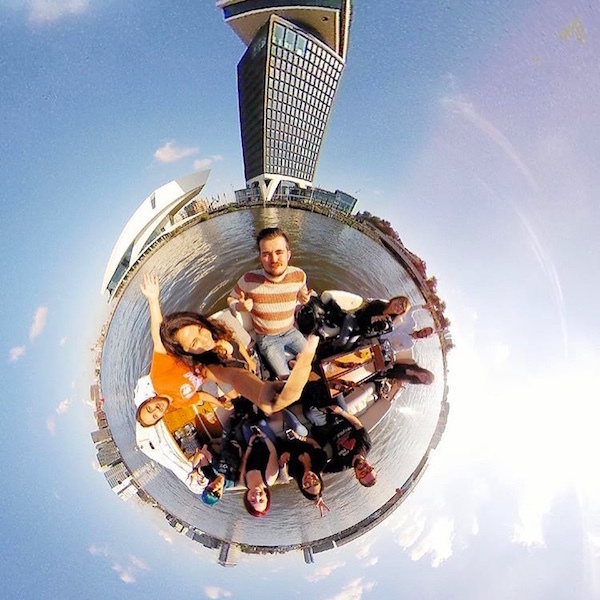 If you’re looking for unparalleled panoramic views of Amsterdam, then this is your baby…but with a twist. 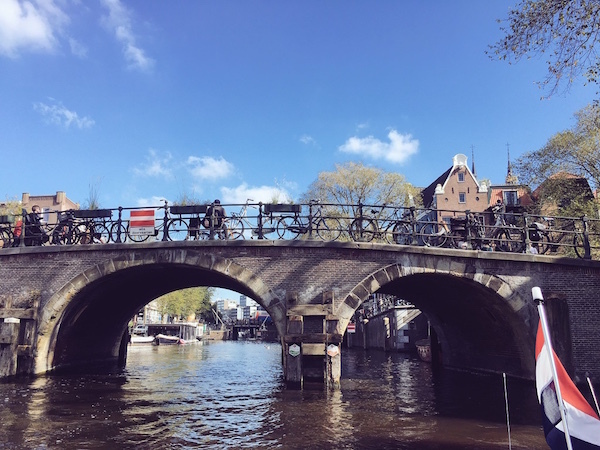 On a clear day (I recommend early morning or sunset), you will be able to see the city’s historical centre, the port, the flat Dutch landscapes that stretch into the horizon and the UNESCO world heritage famous canals. But what’s the twist? Yes, my friends, it’s ‘Over the Edge.’ Now I know I’ve got your attention. 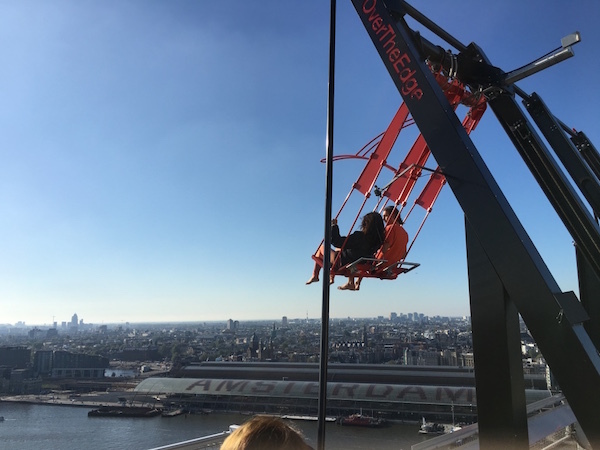 ‘Over the Edge; is Europe’s highest swing on A’dam’s Lookout deck. 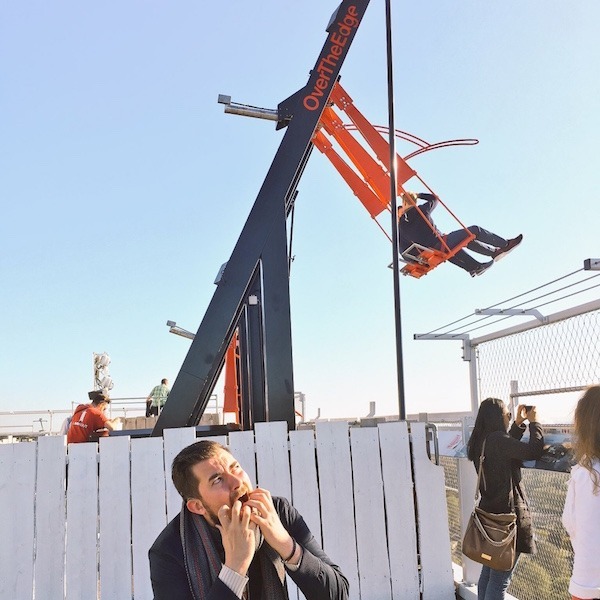 At over 100 metres above the ground, if you’re a screaming thrill seeker like me, you’ll be able to swing back and forth over the edge of the tower! Enter scared face. Strapping on, I wasn’t fazed until the first swing. Adrenaline exploded through my body and my heart flew up to my mouth as I made the mistake of looking down to see the ground 100 metres down below my feet. I definitely screamed as I grappled with the bars. But after the initial shock wore off, I was still screaming but with excitement. With such gorgeous views ahead of me, I was soon entranced by the wonderment of this unique experience of it all. This is definitely and utterly one of the activities you should definitely do in Amsterdam without a doubt! With all that adrenaline coursing through your veins, sure enough, you gotta calm down right? You don’t want to crash and burn. 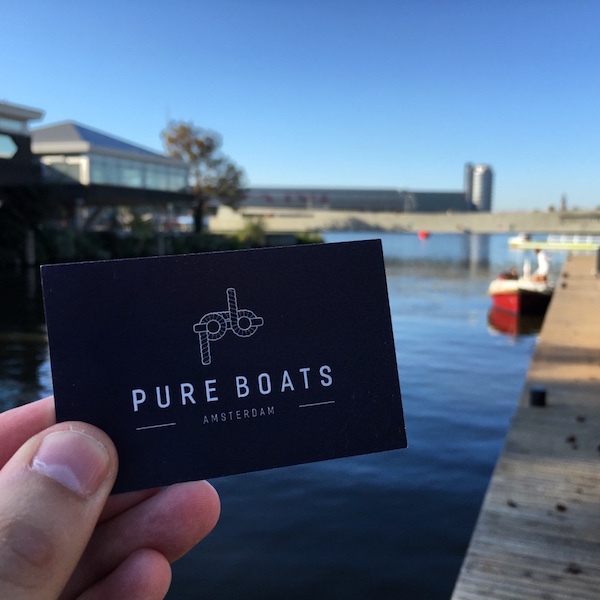 So, just yards away from the entrance, head on over to your booked experience with Pure Boat Tours at the River IJ. This will be a lovely late morning experience to remember. Jumping aboard a classic boat that’s 100% electric and produces zero emissions, you’ll feel yourself snug on their seats and you ears will certainly pick up the clink of glasses by a very welcoming captain (why are all Dutch men good-looking? I really felt I was competing in the looks stage all weekend). 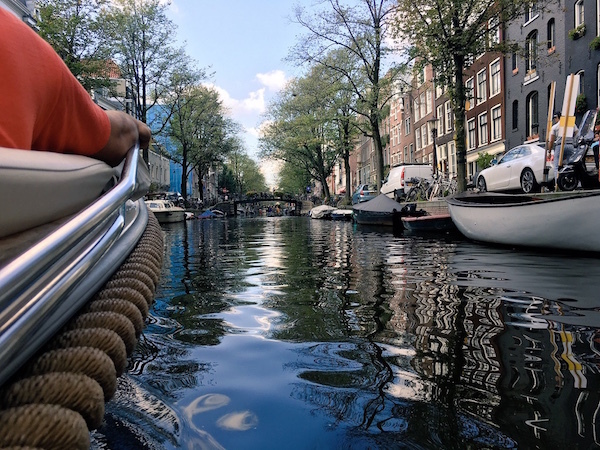 With 10 of us in the classic boat, we drifted off into the canals for a unforgettable trip to explore the hidden corners of Amsterdam that the popular touristy boat cruises wouldn’t show you. This meant a lot of gorgeous photography. 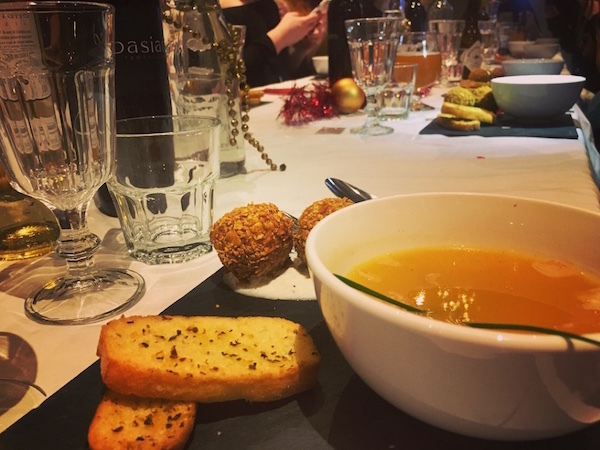 What’s further interesting about Pure Tours is that they work with sustainable local businesses whilst being a sustainable boutique cruise company themselves. Bobbing along the canals with a glass of gin in one hand and having the sun on me (remember, take sunscreen), it was probably the only time I felt utterly relaxed without having to face the touristy crowds. Waving to locals at their windows, it was one of the best boating experiences I have ever done. Now, after that relaxing boat ride, it’s time to get moving. Us adventure seekers don’t want to be spending the rest of the day in a lazy daze, right? 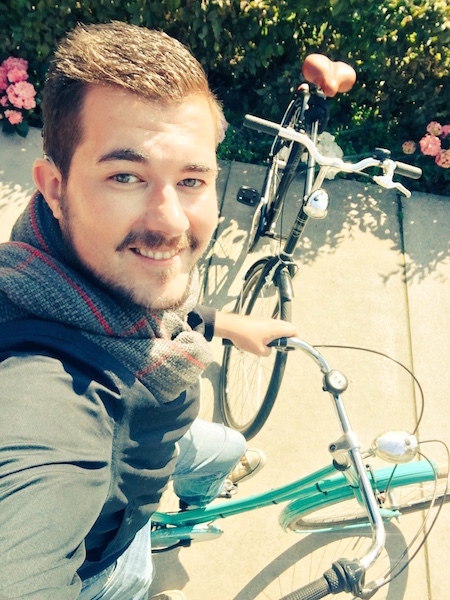 Then let’s do what the locals do and go for a bike ride. 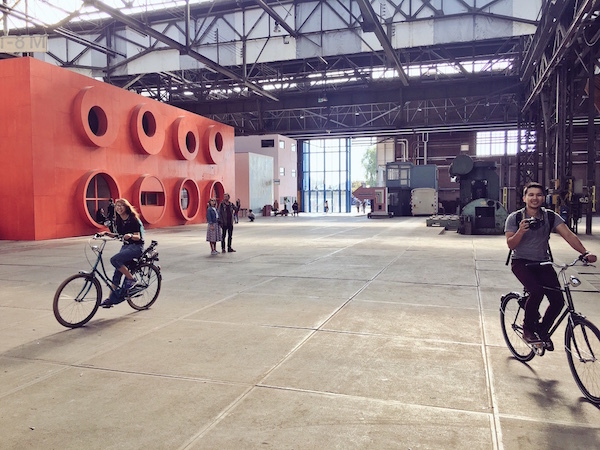 TIP Noord is like a visitor’s centre where you can build your experiences in Amsterdam Noord. You can find out more at their desk in the Tolhul Garden, the offical entrance to Noord, or you can check them out online. You can pick up flyers, maps and brochures alongside the locals but there’s another you can pick up. 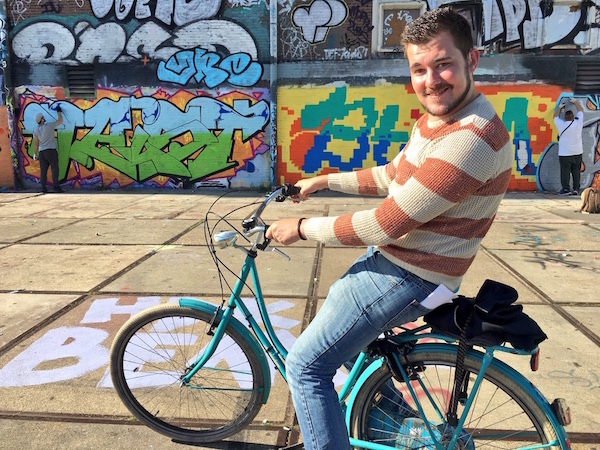 Hiring a rather cool looking bike for the day, you can have all day to explore the hidden secrets of Amsterdam Noord. I really do recommend it as this will allow you to reach out to even more exciting activities for the day. 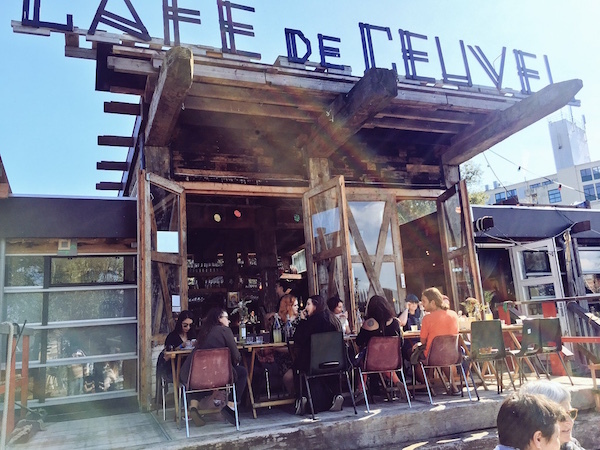 After a period of cycling to work up an appetite, you can make your way to your lunch for the day at De Ceuval Cafe. This award-winning, sustainable planned workplace that has its own cafe is a fantastic social enterprise that’s based on a former shipyard that has resulted in a regenerative urban oasis. Locals working together has created this haven for an eclectic community of entrepreneurs and artists that can work on a plot of land that’s energy self-sufficient and processing their own waste in innovative ways. 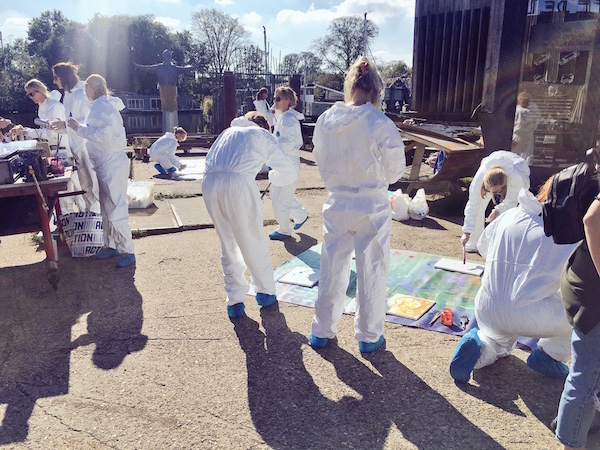 Other than the cafe, you can walk through the land where you’ll find houseboats placed on heavily polluted soil and each houseboat has been fitted with phyto-remediating plants that work to clean the soil. Neat, eh? Served with ginger and rhubarb drinks, this was really a yummy meal to be had overlooking the workspaces. Filled up with goodness, I now had the energy to jump back on my bike to explore yet another hidden secret of Amsterdam Noord. This time it was the turn of NDSM. NDSM Wharf used to be a derelict shipyard that is now a buzzing edgy arts community that takes place in rather a surreal atmosphere that the Lonely Planet has coined the term ‘post apocalyptic’. Stay with me here, it’s all good. A haven for graffiti artists, you’ll be passing by huge murals before arriving a huge warehouse, which you can cycling within, that is filled with artist studios showcasing their best work. The one thing that puzzled me and made me completely laugh is the Barbie peep show showcasing Barbie dolls in incriminating positions! I also recommend going right up to the waterfront where you’ll find abandoned trams on the water’s edge and a few hip bars that you can take a quick drink in. Many festivals also take place here and also happening underground culture events too. After a long but exciting day of exploring Amsterdam Noord, it was time to relax back at Clink Noord with a quick shower (I’m secretly in love with it) but also time to sample the dinners there. Little did we know that a surprise awaited in store for us. 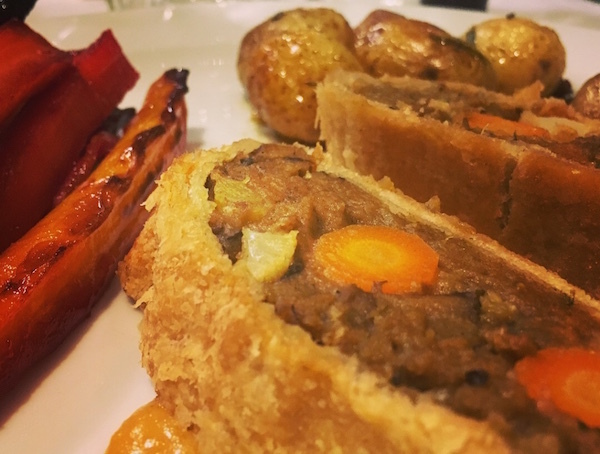 It was very, very quirky for me to have a vegan twist on the Christmas meal. I for one love my turkey and stuffing. But to my complete surprise, the vegan meal was actually a great thumbs up. 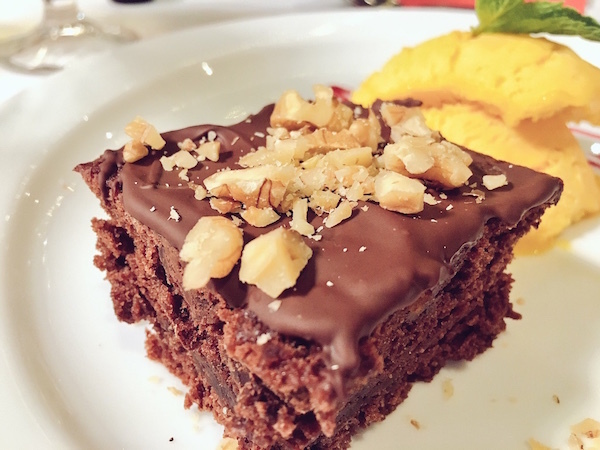 My favourite foods definitely had to be the vegan bitterballen and the brownies. I asked for more haha. 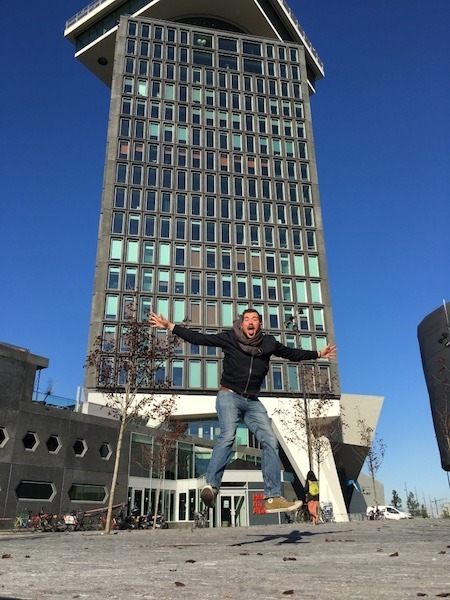 So, what did I think of Amsterdam Noord? It goes no question that it put my faith back in Amsterdam as one of the top cities to visit in Europe. Before, I used to go into central Amsterdam and I was always frustrated and flabbergasted at the unbelievably touristy traps while dodging tourists in my search to find the hidden local secrets. Amsterdam Noord is totally the place to be. 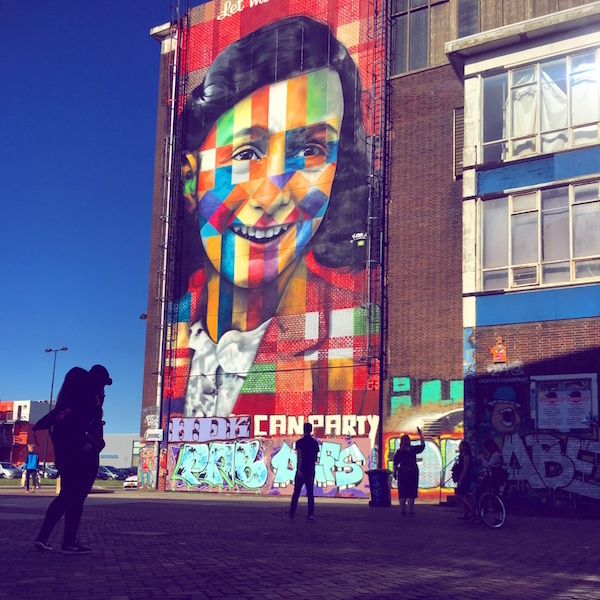 Calm, serene, creative, quirky, unexpected delights, feeling like a local, and exploring true Dutch style are the many descriptions I would have of Amsterdam Noord. 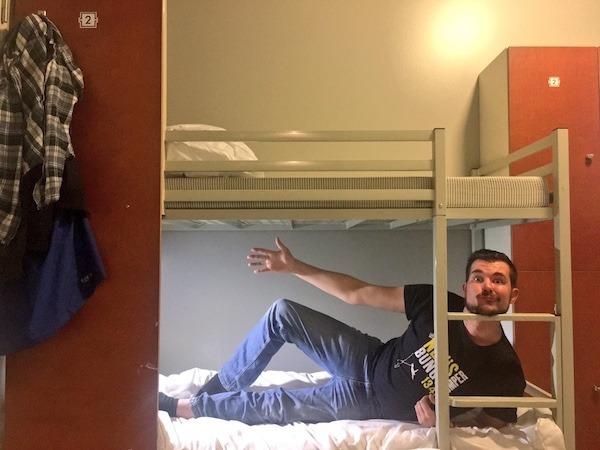 Thanks to Clink Hostels for providing me with accommodation in Amsterdam Noord. As always, my opinions are my own.